Key Difference: Akbar was the third Mughal Emperor to rule India. He was a supporter of arts and literature. Shahjahan was the fifth Mughal ruler and supported architecture and also build great monuments. Akbar and Shahjahan are both well known rulers of the Mughal Empire. These both were famous for their contributions to the Empire and India in general. Akbar and Shahjahan both ruled during different times and are noted for their different skills and tactics. Akbar was the third Mughal Emperor to rule India, while Shahjahan was the fifth Mughal Emperor. Akbar was born as Jalal-ud-Din Muhammad Akbar on 15, October 1542 in Umerkot, Sind to Emperor Humayun and Hamida Banu Begum. He was also known as Akbar the Great and was the grandson of the Mughal Emperor Zaheeruddin Muhammad Babur, who established the Mughal dynasty in India. Akbar was 13 years old when he ascended the throne after the death of his father Humayun. It is believed that Akbar could not read and write, though there are no records confirming this belief. Akbar is praised for this military innovations as well as developing new tactics to maintain peace. He gave orders to being using Kitars alongside the Mughal Talwars during battle, along with manufacturing chain-plate armors and other protective padding. He also began utilizing cylinder rockets against war elephants, which were hard to beat before this. He was also the first to incorporate advanced swivel guns and cannons during battle. The reign of Akbar is known as a peaceful one with limited amount of resistance. He is also known to be a fan of arts, scriptures and literature. During his reign, Akbar commissioned translators to translate literatures from Sanskrit to Persian and Persian literature to Sanskrit. He also commissioned artists to paint murals and art on the palace walls. Akbar also consolidated his power and brought the northern and central Indian realms directly under his power. Though in the beginning of his reign, he was intolerable to other religions, later in life he exercised tolerance towards all non-Islamic religions and even set up a place to have a series of religious debates with Hindus, Jains, Zoroastrians and Portuguese Roman Catholic Jesuits. His tolerance towards other religions played a big part in him unifying his empire, where he would marry Hindu Rajput princesses and allow them to maintain their religion, while giving their fathers a role at his court. Akbar also provided large grant amounts in order to build mosques, temples and churches in India. Akbar fathered three sons and had many daughters from over 30 wives. Shahjahan was born as Shah ab-ud-din Muhammad Khurram on 5 January 1592 and was the third son of Emperor Jehangir and Rajput Princess Manmati, whose name is also recorded as Bilquis Makani in many Mughal chronicles. Shahjahan was the favorite grandson of Emperor Akhar the Great and remained close to him until Akbar’s death in 1605. Shahjahan stayed away from court politics following the death of his grandfather, while continuing his education and training. 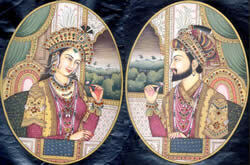 Shahjahan was engaged to Arjumand Banu Begum (Mumtaz Mahal) at the age of 15, but they were wed after 5 years. During his engagement, Shahjahan was known to wed a Rajput princess, whose name has not been recorded anywhere in the chronicles. Shahjahan finally ascended the throne at the age of 35, after the death of his father in 1627. He was forced to openly revolt against his father in 1622 after his father’s twentieth wife Nur Jahan decided to wed her daughter from her first marriage to Shah Jahan's youngest brother Shahzada Shahryar and offer him support to the throne. Shahjahan lost the revolt against his father and was forced to submit unconditionally. Shahjahan’s faced troubles all throughout his reign from Sikhs, Portuguese, Rajputs, Persians, etc. Unlike his grandfather who made alliances with the Rajput kingdoms, Shahjahan opted to capture the kingdoms by force. Shahjahan had an army four times greater in size than the army during his grandfather’s reign. However, Shahjahan is also a patronage of the arts and his under his reign, India flourished in arts and architecture. The land revenue under Shahjahan was the highest than that of any other Mughal ruler. His famous Peacock Throne was taken during the Persian invasion in 1738, after which it disappeared, believed to be stolen or dismantled. Shahjahan loved architecture and had a huge part in the building various famous monuments during his reign. The most popular monument includes the Taj Mahal, which he built for his wife, Mumtaz Mahal, who died giving birth to Shahjahan’s fourteenth child. Other surviving buildings include the Red Fort, Jama Masjid, the Shalimar Gardens of Lahore, sections of the Lahore Fort (such as Sheesh Mahal, and Naulakha pavilion), and his Tomb of Jahangir. Shahjahan was overthrown and imprisoned by his third son, Aurangzeb, who succeeded him to the throne. Shahjahan fathered fourteen children with Mumtaz and one with the unnamed Rajput princess, of which only seven survived into adulthood, which included four sons. Son of Emperor Humayun and Hamida Banu Begum. Grandson of the Mughal Emperor Zaheeruddin Muhammad Babur, who founded the Mughal dynasty in India. Son of Emperor Jahangir and Rajput princess, Princess Manmati (also known as Bibi Bilqis Makani). He was also the grandson of Akbar the Great. February 1556 at the age of 13. 1627 at the age of 35. Liberal outlook on other religions, art, culture and beliefs. Shahjahan had a tolerable outlook on other religions, but was a huge fan of architecture. Art, culture, literature and poetry. Translated scriptures from Persia to Sanskrit and vice-versa. Built several mosques, temples and churches. 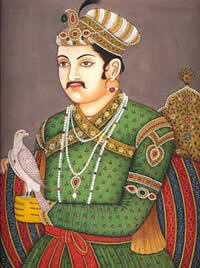 Akbar also strengthened relationship with the Rajputs, making their alliance and the Empire stronger. Architecture, he was also known as the Patronage of the Arts. The land revenue under Shahjahan was the highest during reign of any Mughal emperor. Surviving buildings include Taj Mahal, Red Fort, Jama Masjid, the Shalimar Gardens of Lahore, sections of the Lahore Fort(such as Sheesh Mahal, and Naulakha pavilion), and his Tomb of Jahangir. Akbar had around 30 various women as wives, including many Hindu women. Shahjahan wed a Hindu princess, whose name has not been recorded, followed by marriage to Arjumand Banu Begum (Mumtaz Mahal). His wives also included Akbarabadi Mahal and Kandahari Mahal. Akbar had many children including sons Jahangir, Murad, Danya. Shahzadi Jahanara Begum, Shahzada Dara Shikoh, Shahzada Shah Shuja Shahzadi Roshanara Begum, Badshah Aurangzeb, Shahzada Murad Baksh and Shahzadi Gauhara Begum. nice it is intersting to read this.